The New Covenant is not a continuation of the Old Covenant, nor is it related to the Old Covenant in any way. The Old Covenant was weak and unprofitable (Hebrews 7:18) because it could make nothing perfect, and therefore a New Covenant was needed that was completely different than the Old Covenant. The Old Covenant had many high priests who had to offer sacrifices often for their own sins and for the sins of the people, but in the New Covenant we have One High Priest, "who is holy, harmless, undefiled, separate from sinners, and has become higher than the heavens" (Hebrews 7:26) and who offered Himself up "once for all" (Hebrews 7:27). In this series we've talked about the Levite tribe and priests who received the tithes that their fellow Jews from the other eleven tribes brought to support them. The New Covenant is a matter of a completely different Priesthood. 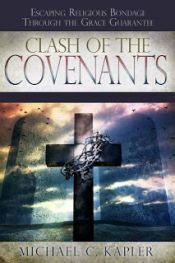 There is no such thing as a set-apart "tribe" or group of Christian "priests" who are sanctioned to perform sacrifices or offerings or other duties that are a part of the covenant. In this covenant, ALL of the work has been done by One High Priest, Jesus. Please understand that the duties and functions of the Old Covenant priests were not carried over into the New Covenant in any way, shape or form. Why? Because it was all done away with (annulled - Heb 7:18, made obsolete - Heb 8:13) and the work of the New Covenant was all fulfilled (nothing left undone) in the finished work of Jesus. In this New Covenant, ALL Christians are a new breed of priests. We are not a physical priesthood, but rather we are "a spiritual house, a holy priesthood" (1 Peter 2:5). We don't offer up physical sacrifices to God, but rather "spiritual sacrifices acceptable to God through Jesus Christ" (also 1 Peter 2:5). We are "a chosen generation, a royal priesthood, a holy nation, His own special people..." (1 Peter 2:9). In the New Covenant there is no "tabernacle" nor "storehouse," nor anything that resembles them. Please don't tell me a church building is a modern day equivalent to the Old Covenant tabernacle! "The church" is not a place. It's not a building nor a location. It's true that local bodies of Christians gather together to meet in buildings, but these buildings are not tabernacles, and they are not storehouses and they are not "the house of God." The "house of God" is the people in whom He dwells. It is a spiritual house, not a physical house (see Eph 2:19-22). Again, we are a royal, spiritual priesthood. This royal priesthood is one body. This one body of new-creation priests (including you and me!) happens to have many parts (see Romans 12 and 1 Corinthians 12), and each "part" has specific functions and giftings within the body - but none of the parts are set apart for ministry in any sense like the Levites were. Rather all the parts "are individually members of one another" (Rom 12:5), and each part is to minister to one another for the profit of all, according to the gifts given them by the grace of God (1 Cor 12:7, 1 Peter 4:10, Romans 12:6). Let's let that sink in a little. One body, many parts. All parts individually members of one another. All parts ministering to one another for the profit of all. Can we see from this that the body of Christ - the spiritual house of God - is nothing like the Levitical system in which one tribe required the support of tithes from all the other tribes. In Christ, the entire body is to support the ministry of the entire body. Now, Paul does indeed say that God "gave some to be apostles, some prophets, some evangelists, and some pastors and teachers." Does Paul lift these people up as being higher on the totem pole than other members of the body of Christ? Does Paul say that they are an extra-special type of "priest?" Of course not! The people in today's church seem to lift them higher, but as far as I can see in scripture they are simply playing their part in the body just like all the other parts are doing! In 1 Timothy 5, Paul talks about "elders who rule well" being counted worthy of double honor, "especially those who labor in the word and doctrine." Now, instead of getting into what all of this means, I'll simply point out what it doesn't mean. None of it has anything to do with bringing a "tithe" of income or of any other physical possession to "a church." Can it mean that other members of the body can give a portion of income, or food, or possessions to support those people? I'm sure it can mean that. But the point is that there is no set amount (such as a "tithe"), and it's most certainly not based upon anything that has to do with the Old Covenant Levite/tithing system! This has gone long so we'll pick it up in Part 9, where we'll finally begin to wrap up this series with a couple of posts on "true Christian giving." Great work in exposing some of the lies the 'tradition of men' has been spreading for so many years, which now being accepted by so many people as if it's biblical and true. It's a dirty job, and I'm glad to do it. :) Just as I know you're doing the same work in your life and on your blog.